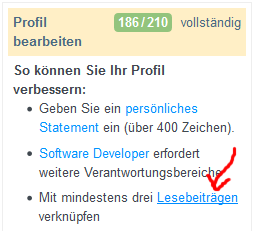 In Careers, I was asked to add more "Lesebeiträge" (which is German for reading contributions), but the Link leads me to https://careers.stackoverflow.com/cv/edit/...#writing, which is about writing contributions. 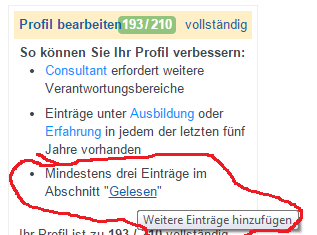 I suggest to correct the text on the link to "Schreibbeiträge" (writing contributions). Maybe also important: it's really the text, not the link which is incorrect, since I already have 8 reading contributions but only 2 writing contributions. Thanks for reporting. We're taking a look at this. It appears there are two issues here. The first is that the text does not match the link (i.e. the translation is unambiguously wrong). For the time being, we'll change this to "Schreibbeiträge". Not the answer you're looking for? 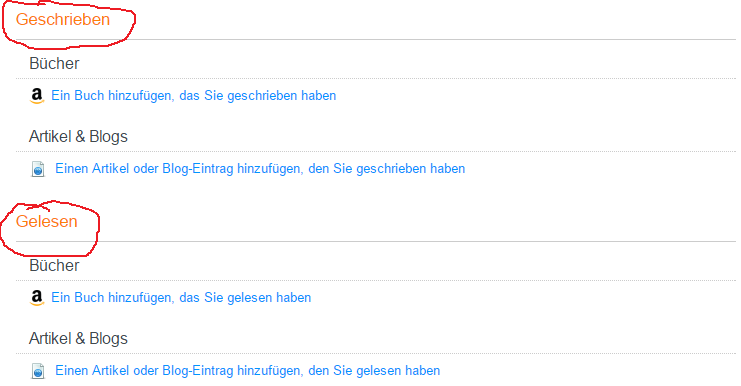 Browse other questions tagged bug status-completed careers careers-germany .